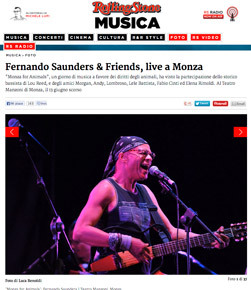 " Fernando Saunders & Friends "
" SUNDAY October 12th - MOODY'S JAZZ CAFE' - FOGGIA "
" TUESDAY October 14th - ST.PATRICK JAZZ CLUB - BARLETTA "
" Saturday 18th of October, 2014 Teatro Concordia (Umbria) "
This is some recent info about me posted on the internet. 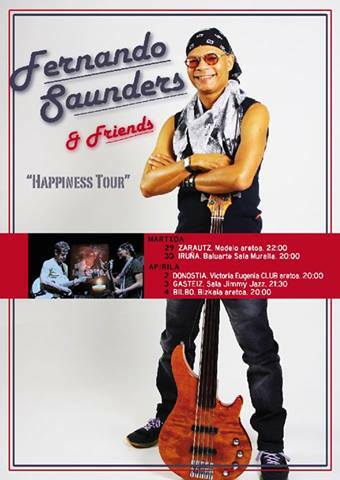 Fernando Saunders & Friends Happiness Tour / Italy. 1. Fernando Saunders & Friends Happiness Tour. Sat.,Oct.11th. Teatro Duse Besozzo (Va) Extra show. Directed by António Pedro Nobre. I would like to Pay My Last Respect to Lou Reed; this is a beautiful song written by Lou Reed-The Velvet Underground - "JESUS". It was recorded live in the studios of Radio Suisse Romande. That evening, I presented my new album under Radio Paradiso, and had a little session for the occasion. Lou Reed also came along as a Special Guest, and performed 3 songs with the band and me. One of the songs was "JESUS", which later we remixed and released. It was nice to perform with Lou and the other musicians in an intimate setting with an audience for the live radio broadcast. This is also one of the last recordings I did with Lou. I would also like to thank Antonio Pedro Nobre again for making this clip, and also Radio Suisse Romande photos by Amy-Beth McNeely. SO!! We have all read some of the postings from Lou Reed fans, musicians, friends, and loved ones, and all has been said in a graceful way. Blessing to all! Fernando Saunders - New clip from album "Happiness"
Fernando has released the beautifully acclaimed CD, "Happiness"
Watch Fernando's new video - "Feel Like Crying (Wept Tears)" featuring Suzanne Vega. Spread the word on your social media about this heartfelt song and video. FERNANDO´S GOING ON TOUR TO PROMOTE HIS NEW CD "I WILL BREAK YOUR FALL" - MAY 2007-SPAIN. May 10 (Thursday) Arno,Rafa and me at home, Ricardo to Valencia, Derek stay one day more and Fernando??????????? 08.14.04...Fernando's latest solo album, "I Will Break Your Fall" released in Japan! Fernando co-produced Lou Reed's latest album, "Animal Serenade"
One of Fernando's favorite NY bands - Katy vs Evil - has come out with their debut CD - "Volume 1." Their ecclectic album weaves in and out of everything from pop rock to trip hop and even a Tango - check it out! Fernando releases his newest CD, "I Will Break Your Fall" available at cdbaby.com and amazon.com! 4.25.03...THE Tonight Show with Jay Leno on NBC Fernando with Lou Reed - "Who Am I"
2.28.03...Benefit: Tibet House - "13th Annual Benefit Concert At Carnegie Hall," N.Y. 2.27.03...Benefit: "The Night Of Too Many Stars" Raising awareness for the Autism Coalition; Roseland Ballroom, N.Y.
8.26.02...Fernando is playing with Lou Reed at the 2002 Bumbershoot Festival, Seattle. 5.28.02...Fernando is in Italy playing with Lou Reed for a concert to benefit the children of Angola. The show features Pavarotti. Sting, and James Brown. For more, check out this page. 5.25.02...Fernando working on the release of his up coming single CD within six weeks, which will include Bonus three songs, an a album CD in the fall. 9.17.01...Due to the overwhelming demand by producers and musicians wanting to know "Fernando - how do you get such warm recordings in such a cold, digital world?" Fernando has opened his NY studio for business...the studio features Avalon mix pre-amps, Fostex tape machines, Logic Audio, and much, much more...stay tuned! 9.16.01...Fernando produces "Hook In My Heart" for up-and-coming recording artist, Lauren Gibbs. 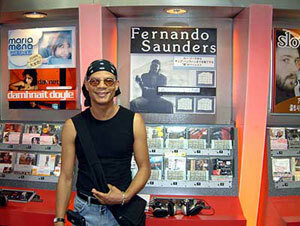 Fernando has been a fan of this talented singer / pianist for several years, whose "beautiful, pure, organic voice has the right elements of country and pop to touch the heart almost immediately..." Hear Fernando perform bass, drums, and background vocals, on this gem of a tune - all with Logic Audio! 08.01...Fern gets back from Spain after playing bass on Basque Artist, "Ruper"
New toys include: Emagic's Logic Audio Platinum Software, ES1 Virtual Synth, and the ESX24 internal sampler.